Palmeiras face São Paulo city rivals Santos tonight in the second leg of the Copa do Brasil final at Palmeiras’ Allianz Parque. The tie is beautifully poised, with Santos winning the first leg 2-1 at their Vila Belmiro fortress last week. Santos dominated the first leg and they may well rue their inability to capitalise fully on that dominance. Despite the 1-0 victory, there were regrets for O Peixe. Goalscorer Gabriel Barbosa, aka ‘Gabigol’ scored the goal that separates the sides in the second half of the first leg, however, his first half penalty clattered the post. Nilson also missed an open goal, as Santos failed to push home advantage to its full extent. They would have banked on building up something of a lead to take across the city tonight. Their home form stands up to any team in world football. They have not lost at Vila Belmiro at all this season, winning 19 and drawing 3 of their 22 home games, scoring 53 goals and scoring just 15 in the process. Palmeiras have won only 1 of their last 8 away matches. The first leg felt like Santos’ chance to pull away. The winners of Copa do Brasil qualify automatically for the Copa Libertadores and teams that reach the final often tail off in the Brasileirão, which has been the case for these two sides. Santos were looking comfortable in 4th place, but since qualifying for the final, they have taken their foot off the gas in the Brasileirão, playing second string sides and their momentum has been arrested as a result. They have won one, drawn two and lost two since qualifying for the final. A free scoring side this season, O Peixe have not scored in their last four games. That statistic is starker still as relegated Joinville and struggling Coritiba and Vasco have managed to shut them out. Santos were favourites for the last Libertadores spot in the Campeonato but are now unable to qualify via that route, having slipped too far behind city rivals São Paulo with a game to go. Palmeiras were also part of the steeple chase for 4th, but since qualifying for the Copa do Brasil final, they have drawn 2 and lost 3 of their Brasileirão matches, shipping ten goals in the process. Palmeiras and Santos have placed all of their eggs in the Copa do Brasil basket and, as an unintentional by product, have breathed life into the relegation battle. Palmeiras too have surrendered points to strugglers Vasco, Atlético Paranaense and Coritiba. So it’s non exaggeration to say that the entire season rests on this one game for both sides. For Santos especially, who have abdicated pole position in the league for the final Libertadores slot. (There is logic at work here, the team that finishes 4th must play a qualifier to ensure Libertadores qualification, whereas the Copa winners are automatic entrants). With Lucas Lima enjoying a breakout season and Gabigol continuing to progress into one of the country’s finest attacking talents, O Peixe will hope to fend off Europe’s January vultures with the promise of a Libertadores campaign in the first half of the 2016 season. It’s a peculiar knack of the Brazilian calendar that the Libertadores finishes in July, half way through the domestic season and just as the European summer transfer window is warming up. The domestic season meanwhile, finishes in December, just before the January window opens in Europe. This has a very marked effect on how clubs do business; it cuts the season into definite halves. Players pondering moves to Europe are often convinced to stay in Brazil until July at least, with a Libertadores campaign viewed as an extended shop window. As for tonight’s game, it’s very much about two teenagers called Gabriel. Palmeiras’ Gabriel Jesus was forced off early in the first leg with a shoulder injury, a further reason for Santos to regret their inability to kill the tie off at Vila Belmiro. But he is fit to play tonight. Meanwhile, Santos’ Gabigol is the competition’s top scorer this season and has become the club’s all time Copa do Brasil scorer too, surpassing Neymar with his goalscoring exploits. Gabigol plays on the right of a front three, with bulldozing 35 year old Ricardo Oliveira, the Brasileirão’s top scorer leading the line. Lucas Lima drifts elegantly behind them, supplying the bullets in Dorival Junior’s exciting counter attacking style. Santos rely on quick transitions and power and pace going forward. 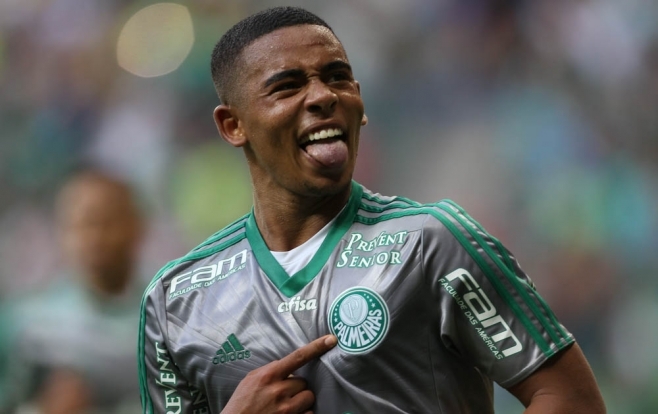 For Palmeiras, 18 year old Gabriel Jesus has become the jewel in their attacking crown. He’s an attacking player in the Brazilian tradition, full of tricks and flicks, he is an exciting player with a cutting edge. Palmeiras were pretty much finished as an attacking force when he was forced off in the first leg. An interesting quirk in the Palmeiras line up is that captain Zé Roberto, now 41, was first capped for Brazil before Gabriel Jesus was even born. The sides played out an entertaining Campeonato Paulista final back in April, with Santos prevailing on penalties, but the stakes are higher on this occasion. Palmeiras have beaten Santos 1-0 at the Allianz in both of their meetings there this season. The first leg featured ten yellow cards and one red and I would expect tonight to be similarly feisty. There is no away goals rule in activation tonight, but another 1-0 win for the home side would see the tie decided on penalties. For both sides, it is no exaggeration to say that the entire season rests on tonight. The match kicks off at 00.00 BST. Prediction: Palmeiras 2 x 1 Santos. Palmeiras to win on penalties. PALMEIRAS: Fernando, João Pedro, Jackson, Vitor Hugo, Zé Roberto, Matheus, Arouca, Dudu, Gabriel Jesus, Robinho, Barrios. SANTOS: Vanderlei, Victor Ferraz, David Braz, Gustavo Henrique, Zé Roberto, Renato, Thiago Maia, Marquinhos Gabriel, Lucas Lima, Gabigol, Ricardo Oliveira.